Muğla / Bodrum / Geriş Mh. 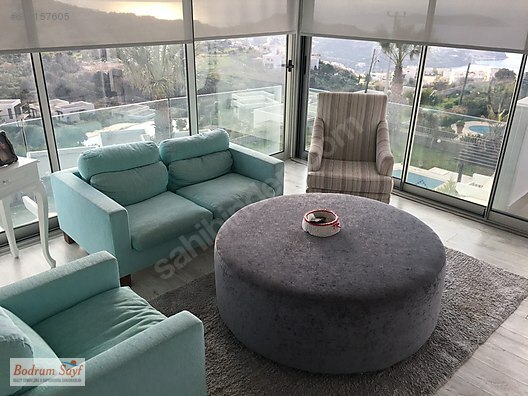 Yalıkavak, Palmarina&apos;ya 4 km , denize 1.2 km mesafede 3+1 deniz manzaralı yamaç yerleşimi özel havuzlu villa 7/24 güvenlikli site içindedir. Sitede 8 ortak havuz, cocuklar için aquapark, oyun alanları, kafe, restaurant, kapalı havuz, fitnes salonu, tenis ve basketbol sahası ve mini market bulunmaktadır. It is designed to provide comfort for up to 7 people. 8 pools on site, 7/24 security, cafe, restaurant, indoor pool, fitness center, tennis and basketball court and a mini market on site. SUMMER MONTHS AND DAILY RENTAL PRICES ARE LISTED AS BELOW. Yalikavak Bodrum stands out as the attraction capital of Turkey. With its booming tourism industry, it’s a great opportunity for adventure seekers or for people who are looking for a holiday in style on the Turkish shores of the Aegean Sea. Formerly a small fishing town, Yalikavak became an attraction for luxury yacht owners to sail in its beautiful bays. Give us a call or a message to find out more about this lovely property to have your dream vacation. HİZMET BEDELİ DETAYLARI İÇİN LUTFEN KONTAK KURUNUZ. BODRUM SAYF REAL ESTATE CONSULTING IS A REGISTERED MEMBER OF BODRUM CHAMBER OF COMMERCE (BODTO ) WITH REGISTRATION NUMBER 009077 AND CONDUCT ITS BUSINESS ON A CONTRACT BASIS.